If you are new to cloth diapering or just want to try a system that does not entail cloth diaper folding, fitted diapers with pull-on diaper covers offer a streamlined cloth diapering system. 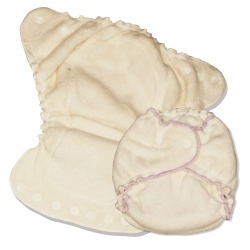 Fitted diapers secure much like a disposable diaper, in the front, or sometimes on the side, with velcro or snap closures. Fitted diapers comfortably deter against leaks with encased elastic at the legs and waists. 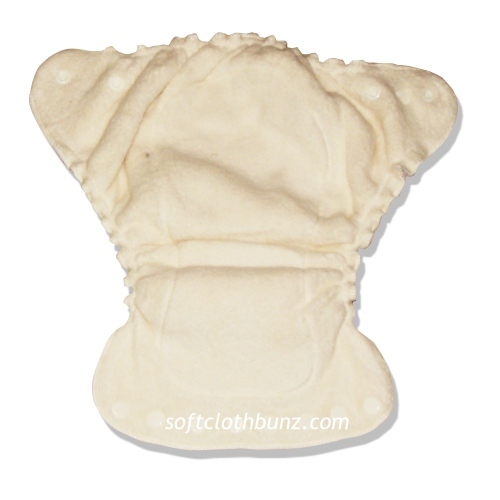 Though most parents find that fitted diapers are very straightforward and easy to use, we have provided a step-by-step demonstration of how to put on a Kissaluvs Fitted Diaper with a Bummis Whisper Pant. Although any cloth diaper cover can be used atop a fitted diaper, the pull-on or side snapping styles of cloth diaper covers provide a fuller coverage and less bulk at the waistline. We find fitted diapers are especially favored by moms of boys looking for a trimmer fit to wear beneath pants and jeans. Overall, fitted diapers have the benefit of being trimmer on your baby for everyday use. 2. 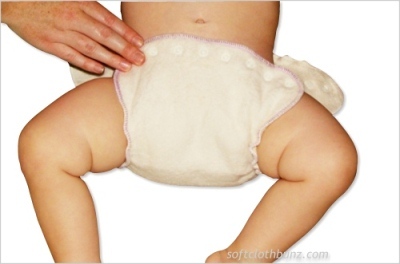 Open the fitted diaper and lay it flat in front of you with the "wings" layed-out side to side at the top. 3. Lay baby atop the open fitted diaper with his/her waistline directly against the back top edge of the fitted diaper. You will see the "wings" layed-out to the left and right of baby's back. 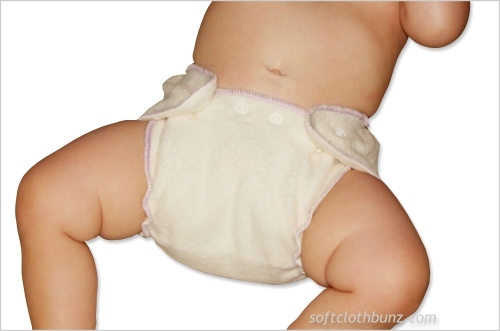 Draw the bottom portion of the fitted diaper up through the legs and to the baby's waistline. 4. Holding one of the back wings, draw it forward to snap or velcro to the front panel. Whether the fitted diaper uses snaps or velcro/aplix, there is always a good deal of adjustability between the different snap settings or the velcro band. 6. Repeat this process on the other side. Most of the time you will need to disattach and adjust according to what is comfortable for your baby. As baby grows, these settings will change until your baby outgrows that particular size of fitted diaper. 7. Remember your baby is laying down at this point, so do not secure too tight or it will be too snug when your baby is in a sitting position. 7. 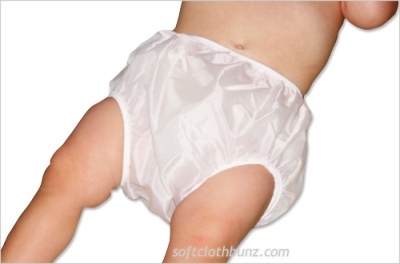 After the fitted diaper is secured to baby, grab a pull-on diaper cover and basically put it on your baby like you would a pair of underwear or pants. 8. Yep, one leg at a time. 9. Do not pull the thigh openings into the crease where baby's thigh meets the body - this will create more opportunity for leaks. Keep it lose an inch or so below the crease. 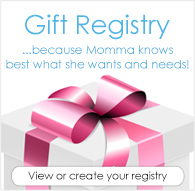 It may work its way there with movement, depending on the age of your baby, but you need not start it there. And you're done. This is a very easy cloth diapering system and favorite of babysitters, grandparents and proud poppas. 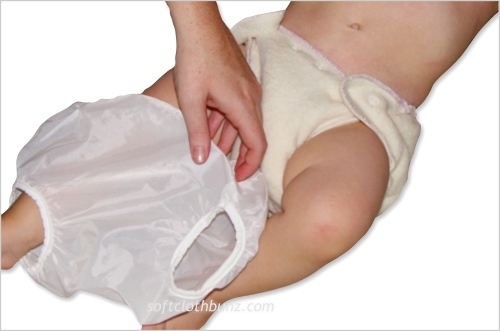 Basically anyone can help you diaper your child when using a fitted diaper and pull-on diaper cover. Another style of cloth diaper that takes the ease one step further are the All In One Diapers, which do not require a diaper cover at all; they are a diaper and a waterproof diaper cover, all in one. Interested in our other styles of fitted cloth diapers? 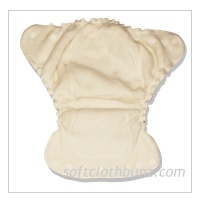 Need a night-time pull-on diaper cover solution for a heavy wetter? Just have a question? Let us know, we'll be glad to help you find the right cloth diapering system for you and your baby.